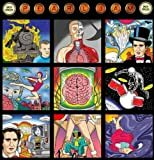 While I consider their first three records among the best recordings I own, shortly after 1996’s “No Code” I no longer got too excited about a new release from Pearl Jam. They too often seemed to go out of their way to avoid good hooks in their music and cluttered their records with baffling filler. I caught wind of the “controversy” surrounding their latest (ninth) release, “Backspacer”, with enough critics and fans slamming the band for sounding too melodic (oh the horror!) that I had to check it out for myself. For me, “Backspacer” is the record I’ve always wanted Pearl Jam to make. It is unabashed garage rock that by in large retains the trademark Pearl Jam sound (hard to avoid with Vedder‘s distinct vocals) yet finally dares to contain songs that you will remember and want to sing. It is a quick fix – just 37 minutes or so – but it comes at you like a bunch of fast jabs, with only a few quiet moments. “Backspacer” makes both the classic and punk rock influences of Pearl Jam more evident than ever. Vedder puts in plenty of umph as usual, but comes across as more sincere this time – you can almost feel him having a good time for once! The band also incorporates some piano, acoustic guitars, and other dynamics that make “Backspacer” an added pleasure to hear over and over again. Refusing to slow down until the atypically gentle acoustic ballad, “Just Breathe”, the band rocks out with gusto on cuts like “Gonna See My Friend” and the catchy single, “The Fixer”. Other highlights include the groovy “Force of Nature” and supercharged energy of “Supersonic”. “Backspacer” is a thrill. Even if you’ve grown disenchanted with Pearl Jam, pick this one up and see if you agree that it is their best since “Vitalogy”. Pearl Jam – official site.